Autism — University Faculty and Staff: What We Know, What We Do Not Know and What We Need to Know (the video below) explains autism from a students’ perspective. Autism spectrum disorder (ASD) is a group of developmental disabilities that can cause significant social, communication and behavioral challenges. There is often nothing about how people with ASD look that sets them apart from other people, but people with ASD may communicate, interact, behave, and learn in ways that are different from most other people. The learning, thinking, and problem-solving abilities of people with ASD can range from gifted to severely challenged. Some people with ASD need a lot of help in their daily lives; others need less. ASD can sometimes be detected at 18 months or younger. By age 2, a diagnosis by an experienced professional can be considered very reliable. However, many children do not receive a final diagnosis until much older. This delay means that children with ASD might not get the early help they need. Diagnosing ASD can be difficult since there is no medical test, like a blood test, to diagnose the disorders. Doctors look at the child’s behavior and development to make a diagnosis. There is currently no cure for ASD. However, research shows that early intervention treatment services can improve a child’s development. Early intervention services help children from birth to 3 years old (36 months) learn important skills. Services can include therapy to help the child talk, walk, and interact with others. Therefore, it is important to talk to your child’s doctor as soon as possible if you think your child has ASD or other developmental problem. Even if your child has not been diagnosed with an ASD, he or she may be eligible for early intervention treatment services. The Individuals with Disabilities Education Act (IDEA) says that children under the age of 3 years (36 months) who are at risk of having developmental delays may be eligible for services. These services are provided through an early intervention system in your state. Through this system, you can ask for an evaluation. In addition, treatment for particular symptoms, such as speech therapy for language delays, often does not need to wait for a formal ASD diagnosis. We do not know all of the causes of ASD. However, we have learned that there are likely many causes for multiple types of ASD. There may be many different factors that make a child more likely to have an ASD, including environmental, biologic and genetic factors. Most scientists agree that genes are one of the risk factors that can make a person more likely to develop ASD. Children who have a sibling with ASD are at a higher risk of also having ASD. ASD tends to occur more often in people who have certain genetic or chromosomal conditions, such as fragile X syndrome or tuberous sclerosis. When taken during pregnancy, the prescription drugs valproic acid and thalidomide have been linked with a higher risk of ASD. There is some evidence that the critical period for developing ASD occurs before, during, and immediately after birth. Children born to older parents are at greater risk for having ASD. ASD continues to be an important public health concern. Like the many families living with ASD, CDC wants to find out what causes the disorder. Understanding the factors that make a person more likely to develop ASD will help us learn more about the causes. We are currently working on one of the largest U.S. studies to date, called Study to Explore Early Development (SEED). SEED is looking at many possible risk factors for ASD, including genetic, environmental, pregnancy, and behavioral factors. ASD occurs in all racial, ethnic, and socioeconomic groups, but is almost five times more common among boys than among girls. CDC estimates that about 1 in 68 children has been identified with autism spectrum disorder (ASD). More people than ever before are being diagnosed with ASD. It is unclear exactly how much of this increase is due to a broader definition of ASD and better efforts in diagnosis. However, a true increase in the number of people with an ASD cannot be ruled out. We believe the increase in ASD diagnosis is likely due to a combination of these factors. 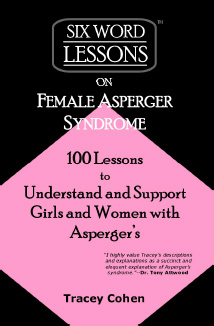 Six Word Lessons on Female Asperger Syndrome is written by Tracey Cohen, who was diagnosed with Asperger Syndrome at age 39. Her book gives you honest, pointed lessons about the condition. She illustrates little-known behavioral differences between male and female Asperger syndrome, early signs for detection, coping strategies, diagnosis and more.